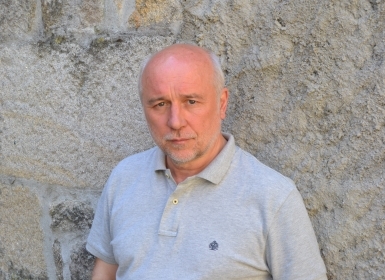 Manuel Lourenzo González is one of few writers to have been awarded the three major Galician prizes for novels – the Blanco Amor, the Xerais and the García Barros – with the three adult novels he has published: Archaeophagy (1995), The Garden of Floating Stones (2008) and Atl (2012). He is the author of six collections of short stories, including a selection set in Pontevedra, Storks at the Bottom of the Estuary (2015), and numerous titles aimed at younger readers, including Brother of the Wind, awarded the Merlín Prize in 2003. He has written two plays, Carnival Play and Music of the Night, awarded the O Facho and Estornela Prizes. He teaches Galician at a secondary school in Pontevedra and has co-authored several textbooks. Atl (536 pages) is a story set in an imaginary future five hundred years from now, after a Final War in which most of the world’s inhabitants have been destroyed, leaving only an isolated community on the island of Atl, ruled by a central government that attempts to control and influence every aspect of their lives, encouraging the pursuit of happiness and dispelling any notions of the past or history. Day 39, 3rd cycle, year 147 of Mun. ‘In the beginning was Al. Al was the essential, full, beating, amorphous, self-contained matter. It is said that in the beginning was Al because before Al nothing existed that we humans could understand. Al came close to what is intelligently conceivable, for this reason we place the origin in Al and not before Al or during Al. The solemn voice emanated from all the screens connected to the Preferential State Multicom Channel, accompanied, in the background, by the soothing tones of flutes and strings. The screens showed fixed images of heavenly bodies, stars, planetary systems and galaxies innocently drawn by inexpert hands, at some remote time no doubt. The gravity of the words matched the gravity of the schematic and primary representations. Suddenly, the soft music and voice were replaced by a sonorous outburst of winds and sylvatic timpani, and the screen offered a sequence of alluring images, constructed this time with almost virtuoso realism, that recreated the years when the universe was formed. Millions of eyes fixed on the screens, watching their magnetic flow, connected from every corner. In the streets, homes, factories, offices, vehicles, churches, stadiums. Calm again.